Elizabeth set up The Haywood Hain LLP in 2008, and also holds a number of NED roles. A former Director of CBI Wales, she is a graduate economist from Cardiff University with a PhD (Politics) from Swansea. Following an early career in the European Parliament in Brussels and Luxembourg, and in trade publications in the USA, she joined the Welsh Development Agency in Cardiff before moving to the CBI. She became Communications Director for the Association of Train Operating Companies, ATOC, and then Managing Director of kmc, a boutique headhunting business. 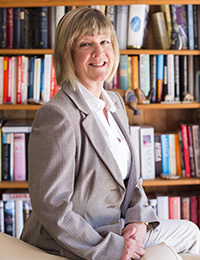 Christine Warwick, MCIPR, trained as a journalist and worked as a reporter and feature writer for regional newspapers in the south of England for 10 years before moving into public relations. Her first role was as head of consumer public relations for Warner Lambert, a multi national pharmaceutical company, in Southampton. She subsequently joined Harrison Cowley Public Relations in Birmingham as an account manager, rising to the position of board director at the company’s Bristol office. From 1989-1994 Christine was public relations director at the Welsh Development Agency in Cardiff. Since then, she has worked extensively as a consultant both internationally and in the UK. She has advised national and regional governments on international investment promotion, as well as devised and implemented a broad range of PR and marketing techniques for blue chip organisations, large and small businesses, the not-for-profit and public sectors. Christine also develops and runs training courses in PR and media relations, mostly internationally on behalf of The Thomson Foundation. She has written a manual on PR and marketing which has been published in Arabic for use by charities in the Middle East. She has been a member of the Chartered Institute of Public Relations for 25 years. Hilary Sears has both private and public sector experience in recruitment and retention. She is now a career coach and mentor, having previously worked in Executive Search, and in talent management in the Cabinet Office where she headed the Brokerage Unit, inputting into the succession planning and talent management programmes. She also ran the Senior Women’s Network, which analysed the diversity challenges within the Civil Service, looking also at Private Sector recruitment and retention strategies and Board needs. Following a first career in advertising, an economics degree and an MBA, Hilary moved into Executive Search, working for international firms (including Korn Ferry Carre Orban, and A T Kearney Executive Search). She has more than 20 years of executive search and Board/Leadership Assessment experience, and sat on the European Board of the Association of Executive Search Consultants (the professional body). She is widely networked in the business world, has spoken at a number of conferences, and was the first woman to appear on the front cover of BusinessWeek international. She is Chairman of the Association of MBA’s, and of the UK charity for disabled children, KIDS. She has been active in trying to promote women onto boards, and as a former Board member of ForumUK (part of the International Women’s Forum), recently chaired their Board Initiative in the UK.